The Rev. 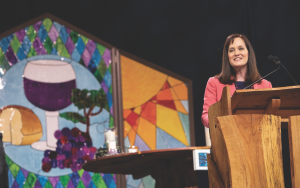 Jessica LaGrone, a member of the Commission on A Way Forward and a General Conference delegate from Texas, speaks on the values of the Traditional Plan during the 2019 United Methodist General Conference in St. Louis. Photo by Kathleen Barry, UMNS. On my first mission trip I travelled to the mountains of Costa Rica with a wonderful crew of warm-hearted United Methodists. While we were there to construct houses, my best work was often building relationships with the children of the village, who taught me games and laughed at my beginner-level Spanish. One day a group of them shyly pulled me by the hand and told me they were going to show me the most beautiful place on their mountain, an amazing claim considering this was already the most beautiful place I had ever seen. After a long, breathless hike, we turned a corner where I saw, in the middle of all the rugged mountainous glory… a lawn. A simple, flat lawn, just like thousands of suburban landscapes back home. To put it bluntly, I was underwhelmed. Just then, one of the boys pulled out a soccer ball and they began running and kicking it with glee. This space, while it looked ordinary to me, was their soccer field – or football as those of you from outside America will correct me – it was the only one for miles. To them it was holy ground. As they began to run and play (many of them barefoot), I recognized that they were right. In the freedom and joy of these children of God I found the most beautiful sight I would encounter on that mountain. In the life of the Church, the playing field of doctrine and discipline exists not to constrain or dehumanize God’s people, but to provide the kind of rules and order that allow a space for a kind of disciplined goodness to run wild. But the growing chaos within The United Methodist Church has overtaken our life together, distracting us from our mission and raising our anxieties. The decades of conflict have muted our hopes for world-changing ministry and damaged the vitality of our shared witness. While a healthy Church is missionally intent on welcoming players to the field, the current state of our Church is one in which many are playing by different rules, and some wonder: are we even playing on the same field any longer? The aim of the Traditional Plan is to strengthen the long-held convictions voted on by each General Conference since 1972 and to restore the order and discipline that have been lacking as our conflict has grown to unmanageable proportions. The Traditional Plan affirms that the statements in the Book of Discipline addressing human sexuality and sexual ethics reflect the teaching of Scripture, relevant to all times and places, taught by the Church in its diverse confessional forms and cultural contexts. For United Methodists, the clarion call of the inspired Word of God burns in our hearts and establishes the boundaries of our faith. As children of the Wesleys, in Scripture we find life – and life abundantly. The Word of God convicts and comforts every heart, for every one of us finds our hope in Jesus Christ alone. In its affirmation of the belovedness of all of God’s children of sacred worth, the Traditional Plan does not require or permit shaming, hatred, self-righteousness, abuse of power, or cold disinterest, as we serve neighbor, stranger, friend. First, the Traditional Plan values Unity in Doctrine. It celebrates the beliefs proclaimed in the historic yet timeless Apostles and Nicene Creeds, the Articles of Religion, The Confession of Faith, and the Standard Sermons and the Notes upon the New Testament. It maintains that receiving the Scripture as authoritative and inspired is essential for those claiming a share of the worldwide Wesleyan Methodist movement and specifically the United Methodist Church. Second, the Traditional Plan values Consistency in Practice. It affirms that the clarity of our Discipline on Sexual Ethics should be clearly followed with an outward consistency in our practices across the connection. As United Methodists, we have proudly held to a unity of practice for important issues such as the ordination of women and infant baptism, despite the fact that the Church has not always been of one mind on those issues. The Traditional Plan affirms that coherent unity of practice in marriage and ordination should be held at a connectional and not a congregational level. The Traditional Plan holds that this consistency in practice is connectional not only within the United Methodist connection but with the Church throughout time and around the globe, especially honoring our connection with our brothers and sisters in the global south. Third, the Traditional Plan values Accountability. Wesleyan discipleship has always valued the deep awareness that we belong to each other and hold each other in mutual accountability. Leaders of the Church have voluntarily taken on responsibility for the life and witness of the Church and in doing so bind themselves to live within the provisions of the Book of Discipline. Failure to follow the standards agreed upon by General Conference corrodes the unity of the Church and must be addressed in order to restore health to the United Methodist body. We lament the ways in which at times the Church has lacked consistency, especially at times when our covenant has been broken. Our unity is broken by principled disobedience on the part of some bishops and clergy. The establishment of additional accountability is vital. The Traditional Plan both enhances the current accountability in the Book of Discipline and closes the loopholes currently being used to break our shared covenant. The Plan provides for Annual Conferences, local Churches, bishops, and clergy who cannot in good conscience live according to our covenant to withdraw from the denomination in a gracious way, recognizing that the Church’s unity is not well served by attempting to force those who cannot support our Church’s teachings to remain in the denomination. This has the potential to maximize our witness by allowing different groups the freedom to engage in that witness according to diverse standards and providing both space and continuing connection and cooperation in a new form of mission and ministry. Aligning with the Commission’s Mission, Vision, and Scope, the Traditional Plan affirms that “The matters of human sexuality and unity are the presenting issues for a deeper conversation that surfaces different ways of interpreting Scripture and theological tradition.” Simply put, our beliefs and our actions matter; theology and practice matter enough to minister with consistency across our connection. 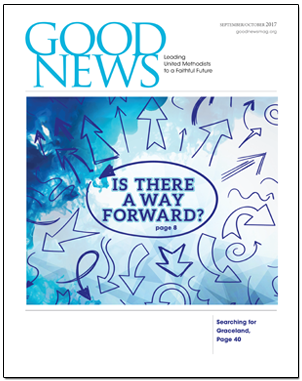 The beauty of belief and practice as set out in the Traditional Plan allows us to envision a path of thriving mission and ministry, our calling to a playing field where we run with joy within the ordered space of our life together as United Methodists. Come Holy Spirit. Jessica LaGrone is a United Methodist clergyperson, the Dean of the Chapel at Asbury Theological Seminary in Wilmore, Kentucky, and a member of the Commission On A Way Forward. She was a General Conference delegate from Texas and is the author of several books including, most recently, Inside the Miracles of Jesus (Abingdon). Isn’t it amazing that I have studied the Bible for the past 50 years, poured over the same scriptures as you, immersed myself in hundreds of hours of group Bible Study, attended thousands of hours of Worship, prayed a lifetime of prayers, have been called to faithfully serve and follow Jesus…..and, have arrived at a different understanding of human sexuality than you? Perhaps, you are wrong in your understanding and interpretation of scripture. Only God knows, and I would rather leave the job of who’s in and who’s out, up to him…you don’t seem worthy of the almighty task. Jane, what a cheap shot at Jessica there at the end of your comment. Yes, she and I and all other Traditionalists may be interpreting Scripture incorrectly in your view. The salient point of our position in this disagreement within the UMC is that our view has always been the official interpretation and position of the UMC, and those who disagree need to find a church home that aligns with their position and interpretation of Scripture. As an analogy, why would Person A continue to eat at a sushi restaurant for years on end, continually asking the proprietor to change the menu and even saying nasty comments to the other customers, when Person A doesn’t believe sushi is tasty? BAM!!! Even I got that one! Now, maybe, instead of viewing the end of the ‘United’ Methodist Church as DIVISION, we should look at this as MULTIPLICATION. What a magnanimous and gracious retort, Jane. Rather than smugly portraying yourself as the hero erring on the side of grace and Rev. Lagrone as assuming a God-like position of judgment, perhaps you might consider how arrogant it is to discard two thousand years of Christian teaching, about the same amount of Jewish teaching preceding that, the plain meaning of the Scriptural text, the sophisticated interpetation of a great many academics whose approach can hardly be brushed aside as “fundamentalist,” and the profound consensus of the church worldwide on the basis of your miniscule by comparison personal experience and tiny sliver (again, when compared to the history of Christianity and the world-wide church today) of academics, who, like yourself, have deemed themselves worthy of passing judgement on all who have gone before and all who hold faith today with those who have gone before. Who’s playing God now? I guess it’s all a matter of perspective, but I find it difficult to accuse others of being judgmental without passing a great deal of judgment myself. The scripture is clear! The only difference is that some reverence and over the scripture, others, accordito our bishop’s words “appreciate scripture”. But where do we go? I am a lifelong Methodist and I cannot find a denomination which more closely follows my own personal theology than United Methodism. After our church took its stand on abortion I looked for a different denomination but none fit my theological beliefs. Certain things in our discipline such as our semi-approval of abortion are absolutely appalling to me. Our stand on homosexuality is, in my opinion, anything but loving. It is obvious that we see the homosexuals as unrepentant sinners and discriminate against them. I do not approve of this stand no matter how determined the church is to keep us unified. If I were a pastor who could not support the Traditional Plan I would be expected to leave The United Methodist Church. But I must wonder, if I decided to leave, where in the world would I go? Why are we so troubled by homosexuality which Jesus never spoke about. If we are to be Biblical and take the words of Jesus literally, folk who divorce and remarry are committing adultery, which is addressed by the 10 commandments. Might if be that we have come to new understandings of interpretation and no longer see divorce as an unforgiveable sin? The real issue is not homosexuality, I believe it is about power and control about who is in and who is out and who is right and who is wrong rather than loving as Jesus loved. Maybe if we were more focused on how we can love unconditionally like Jesus then our focus might change. I remember Peter seeing sheet let down and invited to eat of what was there and being told it was not be to be called common or unclean. I pray for the day we hear the same Spirit call us to less judgement and more grace, less defensive justification of our position and more acceptance of all God’s children with their gifts and graces for ministry as one of God’s beloved children.